I found Jason Boyett’s blog sometime in the past year. I liked it – his humor, his honesty and his questions. And I looked forward to his latest book “Oh me of little faith” for all those reasons and because the sub-title is: True Confessions of a Spiritual Weakling. I love the humility in that line. There’s enough of books from people that have ‘figured it out’ and that give 17 steps to success. The book was what I expected it to be … a memoir that was honest, real and well-written. And left me with more questions and thoughts to ponder – which feeds my curiosity addiction. He allows some thoughts to ‘hang’ – without feeling the need to wrap everything up in a ‘nice box with a bow.’ I have post-it markers on many pages. I love his illustration about how marriage and parenting are both filled with uncertainty, but yet we move ahead doing the best we can in both areas and that is what we need to do with our faith, even when we have doubts. JO: Is there a particular thing/incident/reason that you decided now is the time to write a memoir, or did it just feel right? JB: I delivered a sermon at my church in 2007 (filling in for our pastor), in which I decided to stop pretending I had it all figured out and openly confessed to having doubts. The response was really encouraging. So many people thanked me for expressing something they didn’t feel they could talk about safely in church. That’s when I began thinking that there might be something to the idea, because at that point, no one was really talking or writing about spiritual doubt. But clearly we needed to. So I put together a proposal and eventually it landed at Zondervan. Was there a particular chapter in the book that was really fun and/or easy to write? Why? What about one that was difficult to write? Why? “Turtles All the Way Down” (Ch. 2) was a lot of fun to write, just because I got to base the whole thing on a giant stack of turtles in space. I just kept smiling at that image, even though there would be times midway through when I’d think to myself, “I am writing about the existence of God and the whole thing seems to revolve around a turtle metaphor. I am so screwed.” But any time you can build a chapter around both a Stephen Hawking illustration AND a Dr. Seuss story, you are going to enjoy yourself. The hardest chapter to write was “Reverse Bricklaying” (Ch. 5), the one about prayer and my brief foray into charismatic Christianity. Maybe three people on earth knew that Brazil story, and having to dig back into that muck was tough. It was hard going back to that mindset, and even harder to tell a story that makes me feel pretty vulnerable. Even today, I don’t feel good about that year in my life. You wrote that you’ve experienced God’s presence ‘three and a half times’ … is it difficult to hang on and continue to believe in those times over the years? Yes it is. I’ve held onto those times, but my inner skeptic can certainly find ways to start debunking the “God” aspects of those stories. Maybe not with the earliest one (the Philippians/couch experience), but definitely with the other two. There are a lot of elements in those situations — foreign country, physical exhaustion, emotional exhaustion, heartache, community — that can make a person especially receptive to spiritual things. The religious person would say that it makes us more receptive to God or the Holy Spirit. The atheist would say it makes us more receptive to emotions we’ve been conditioned to view as God, but which are really just chemical reactions in our temporal lobe. I admit: some days I lean more toward the second explanation than the first. At this time, praying liturgical prayers is not something I do, but I found your thoughts about that interesting. But does praying someone else’s words every feel fake and/or like you are reading Hallmark cards to your wife rather than telling her in your own words how you feel about her? Granted, some of the lyrics to worship songs are even worse than Hallmark cards, but it’s the same situation. We are speaking to God using someone else’s words. The difference is that, with liturgical prayer, you’re using words that have been prayed by Christians for hundreds of years. When I pray the Lord’s Prayer, I’m praying in the same manner that Jesus told his disciples to pray. No, they aren’t my original words, but what kind of hubris does it take to think I can come up with something better than Jesus…right off the top of my head? I’ve studied heaven and hell a little and you gave me a lot more stuff to ponder … any more information or thoughts since you wrote the book? No. Nothing new. I’m pretty much stuck in the same place as when I wrote the book. This is one of those issues where education/knowledge really seems to get in the way of faith. A logical, rational person will look at the evolution of afterlife beliefs among the Israelites and has to admit there are some real questions that come up. If heaven and hell are/were an eternal reality, then why did God allow the Israelites to go thousands of years without knowledge of these destinations? Because up until the Exile, all the biblical writers talked about Sheol instead of heavenly paradise or the punishments of hell. EVERYONE went to Sheol. So God gives them instructions on where to sew the tassels on their garments but doesn’t reveal to them the existence of heaven as an eternal resting place for believers, or hell as a destination for the damned? THOSE details he left out? Really? I have a lot of trouble making excuses for this. But heaven and hell are such an important part of the Christian tradition and doctrine — and clearly Jesus believed in them — that I don’t know what to do. I’m reluctant to bury my head in the sand and pretend I never learned this stuff. But I’m just as reluctant to just toss them out the door as human constructs influenced by the Persians and Zoroastrians, either. So I’m stuck in these questions. Not sure I’ll get any answers this side of death. I like your thoughts about ‘ask, seek and knock’ in the last chapter – what are you asking/seeking/knocking about these days? As always, I’m asking for grace and mercy. I pray the Jesus Prayer: “Lord Jesus Christ, son of the living God, have mercy on me, a sinner.” I ask for increased faith…but until it arrives, I ask for the strength to continue following even when the following has to get ahead of the belief. Jason and I also share a love of being active. So I wanted to know more about his running and triathlons. How long has running been a part of your life? What about triathlons? I participated in my first sprint triathlon in the summer of 2008. Prior to that, I’d begun swimming longer distances as a way to get into shape once I hit my early 30s and saw my metabolism slowing down. While training for the triathlons, I discovered how much I enjoyed running — at least, running up to around 8 miles or so (after that point, it becomes much less enjoyable). Before the triathlon thing started, I was never a runner. I hated it. I used to try to run a mile and disliked every minute of it. Not sure what changed, but by forcing myself to train for an actual event on the calendar, I discovered that I liked it. Exercise really is addictive, in all the best kinds of ways. Sorry to hear about your current MCL sprain … was this a slow injury or was there an incident that caused it? What does your recovery look like? How long? Physical therapy needed? That’s a great question. If anything, it’s taught me that there is value in continuing to push through, even when you seem to hit a wall. During the lake swim of my triathlons, I find myself repeating the singsong voice of Dory from Finding Nemo: “Just keep swimming, just keep swimming.” Even though my brain is telling me to stop and my lungs are complaining and my psyche is freaking out because I’m in 100 feet of green water surrounded by thrashing limbs. You keep moving, despite the challenges. Eventually, you transition from swim to bike to run — or from one form of faith to another — but still you keep moving. Don’t let the wall of doubt stop you. And have you found any connection between being physically fit and spiritually fit? I’ve also discovered that long runs or long swims provide a good environment for prayer — especially the repetitive, contemplative kind. So, yes, I guess there’s a good connection between physical fitness and spiritual fitness. Thanks Jason for taking time to answer my questions! Great answers, with more good stuff to ponder. Love the thought about not letting the wall of doubt stop us – either in exercise or in faith. 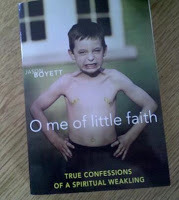 Readers – if you didn’t understand some of our Q & A here, pick up a copy of his book “Oh me of little faith“ to read what prompted my questions. Or ask me in the comments here or ask Jason on his blog or twitter. Well done Janet. I like the Q/A format for the interview. You did your homework. Great first interview Janet! Definitely makes me want to read the book.